Nucleus honeybee colonies are normally ready in June give or take a month. Naturally, this is very much influenced by the weather. The nucleus colony will contain a minimum of 5 combs or frames containing immature bees (brood) of all ages together with nectar and pollen stores, covered with adult bees and headed by a laying queen bee. This means that although the colony is small, it is established and ready to expand in population given the optimum conditions. Bees travel well with a few precautions. The hive must travel upright, as level as possible, with their combs in line with the direction of travel. This prevents combs possibly slapping together if you brake suddenly and comb breakage is a possibility. The floor of the nucleus box we provide is covered with mesh for good ventilation, enabling the bees to fan and keep themselves cool if necessary, so make sure there is good air flow underneath the box and through the vehicle - be careful not to poke something through the mesh. Provided there is good ventilation, overheating in the hive is rare unless ambient temperatures go over 35ºC. This is not usual in the U.K. but if it does get this hot, keep the outside of the box wet and spray water through the mesh and this will allow the bees to keep themselves cool. The bees should not be transferred to their new hive straight away, they will not know where they are which results in confusion and loss of bees. The best plan, as soon as possible after you get home, is to place the nucleus box in front of the full size hive that will be their new home. Place it as close as possible, on a stand if necessary, so the entrances on both hives face the same way at about the same height. As soon as this is done remove the sponge entrance block and run away! In good flying weather the bees will learn the location of their hive within hours. The following day or on the next good flying day (but no longer than a week), the bees must be transferred into the full size bee hive box and the nucleus hive removed. The bees easily locate the entrance of the full size hive with a minimum of stress and disruption to the colony. Do not put additional boxes on top until the colony needs them otherwise they will waste energy heating the empty space above them. 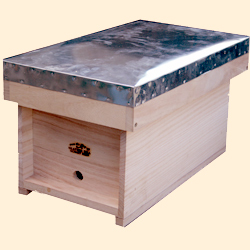 A second box should be provided when the colony is nearly filling the first, a third box is provided when they are nearly filling the second and so on. The nucleus will have enough food stores to prevent immediate starvation but it is recommended to give the colony steady feeding with 50% syrup as soon as they are in their full size hive. Unless the weather is perfect and there is a strong nectar flow (this is not often the case), the colony will not grow and expand as it should without supplementary feeding. On average the bees may consume about a pint a day but restrict this to about a gallon a week if necessary. Excessive feeding at this early stage when they have a limited amount of comb can result in the bees storing the syrup in comb where the queen should be laying her eggs which is obviously detrimental. The colony should double in size and population before September. Feeding for winter should start at this time and any Varroa treatment, if necessary, should also be applied now. We are professional bee breeders and members of the Bee Farmers Association. All of our livestock is regularly checked by us for disease. Varroa mites (Varroa destructor) and Chalk Brood fungus (Ascophaera apis) are endemic in the U.K. so these may be present at low levels in the colony.